4 large cotton cloths and 6 sponge covers to facilitate the collection of the dirt melted by steam. 1 small brush that can be used for textiles, velvet and leather, car seats and interiors, dirty windscreen, small glass windows, tiles and other small surfaces. 1 squeegee to be connected to the small brush. The rubber squeegee insert is designed to wash glass windows without leaving marks or halos and clean last longer. 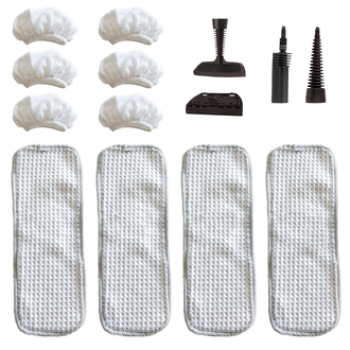 This accessory also removes the invisible film that detergents leave on windows and grease and dust stick to. 1 adaptor with 1 lance. The adaptor enables the connection of the steam lance to the hoses or to the handle directly in order to obtain a concentrated jet of steam.